White bread doesn't get too much love anymore, what with the push to consume more whole grains (not to mention the rise of gluten-intolerance). It has its place, in my opinion, and I'm certainly not ready to do away with it completely. I grew up eating IronKids bread--do any of you remember that, or heck, still eat it? Does it even still exist? I don't know, because thanks to Eb and a few awesome bread recipes, I haven't bought a loaf of bread in the store for ages. Anyway, my point is that I liked white bread then--all fluffy and soft and ideal for transporting various meats and cheeses to the mouth--and I like it now. My favorite way to make white bread is (surprise, surprise) with a cinnamon swirl. Not only is it tasty, but it looks so attractive and welcoming. It's easy to accomplish, too--it only adds about 10 minutes to your work time. Most (if not all) recipes I've seen for cinnamon swirl bread use milk and eggs, but this isn't one of those. It's simply white bread with a cinnamon-sugar-raisin filling. Odd? Perhaps, but darn tasty. 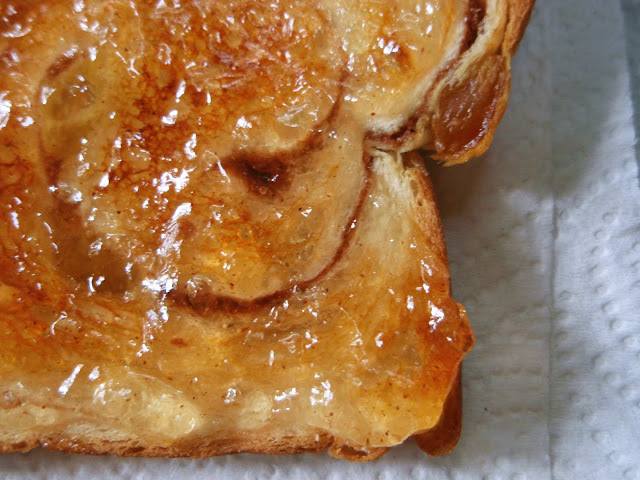 When it comes to the eating, french toast is always a good option. For my time and energy, I'm content with simply toasting it and slathering on some apple jelly. Don't hate on the white bread, folks. It's not good-for-nothing. **Congrats to Angela--Snubbr picked hers as the winning comment in my cookbook giveaway! In a large mixing bowl, combine 2 cups flour, sugar, salt, and yeast. Beating at low speed, add the water and butter. Continue beating at high speed for 3 minutes. Add 1/2 cup flour and beat 4 minutes longer. Stir in 3 cups flour, or enough to make a soft dough. Turn out onto a lightly floured surface. Knead for about 8 to 10 minutes, or until dough is smooth and elastic, adding a little more flour as necessary. Place the dough in a large greased bowl, turning to anoint the top. Cover with a clean towel and let rise for about 1 hour in a warm place, free of drafts. Punch dough down; knead until smooth. Cut dough in half, cover with the mixing bowl, and let stand for 15 minutes longer. Roll each half into a 12x9-inch rectangle. Sprinkle the dough generously with raisins and cinnamon-sugar and press in gently. Then, starting with the narrow edge, roll up, turning ends under to make loaves to fit pans. Place rolls seam side down in greased 9x5-inch loaf pans. Cover pans with clean towel and let rise in warm place until double, about 45 minutes. Bake loaves at 400° for 25 to 30 minutes, or until loaves sound hollow when tapped with fingers. Remove from pans to racks; brush with butter for a soft, more flavorful crust, if desired. I love all breads! This one looks sooo gorgeous! I grew up eating white bread too-and agree 100% with you about whole grain bread. I love its heartiness, but every now and then...only soft, fluffy white bread will do. I adore white bread, especially cinnamon swirl! I really don't like whole grain breads, I only eat them because they're supposedly better for me. My favorite sandwich bread used to be potato bread, as my mom was trying to get me to branch out from white bread. I also LOVE cinnamon swirl bread, minus the raisins. I confess: I rarely make bread and when I buy bread, it's not plain white. It's whole wheat, sour dough, or grain. We used to line up waiting for hot cinnamon bread when I was in boarding school. I share your love for cinnamon, Grace. I would have put butter, then more cinnamon and sugar on that piece. Oh my. I should NOT be reading this before breakfast! I think there's a time and place for all things...even white bread. And when it has a cinnamon swirl running through it...that time might be every second of every day. And that place might be my belly. I am suspicious of those that claim to dislike white bread! I was fed up with all the additives in supermarket breads and so I gave up buying them. Needless to say, I've enjoyed baking bread, but I 've been missing cinnamon toast! Can't wait to try this recipe. And thanks for the kind words on my blog. I came across yours on foodblogs.com and loved it! Nothing in the world is better than freshly baked white bread, not even chocolate. I would eat a whole loaf by myself, and with cinnamon, this is perfect, yummy. I had to read this at breakfast time without the time to make a loaf. What sadness. Darn cool recipe and something I will try on a morning with more time to enjoy the simple pleasures of not so white bread. I don't bake, but I'd love a slice of that for breakfast! Looks divine. Wow, I'm so impressed that you make bread so often you don't need to buy any. I must confess I actually liek white bread but buy wholemeal instead because it's "healthier". Grace...bread in all forms are my weakness. As I got a little younger LOL...my stomach has nudged at me to make heathier choices which have led me to scrumptious artisnal bread. So far, I'm still not a fan of the GF breads I've tested from the store. However, don't get me wrong...I love white bread especially with yummy raisin and of course cinnamon ;o) I especially use it to make french toast with them. That looks like the perfect bread for French toast! Heavenly, thats what this bread is Grace. While I usually buy whole wheat bread, there's nothing quite like a fresh loaf of homemade white bread fresh from the oven! Especially if said bread is full of cinnamon and raisens. This bread makes the cherrios I'm eating right now look rather pathetic. This looks great. I love a good raisin bread, and I think white bread is part of our childhood. I love cinnamon swirl bread, and I don't know why I've never made it. If this only takes 10 minutes, I have no excuse not to try it! Looks fantastic. Beautiful! Slathered with apple jelly? Wow. My boring breakfast just isn't doing it for me anymore. That does look darn tasty, Grace. Love the close-up shots. Yum! This is totally nostalgic :) I love me some homemade white bread, all soft and fluffy. And with a cinnamon swirl? Good heavens. That's good stuff. I like white bread too. It may not be the perfect food but you could do worse. Fresh and hot from the oven it is a real treat, especially with a gorgeous cinnamon swirl. YUM! I agree, all breads have their place, and there are certainly times for white!!! Like cinnamon swirl bread. ( : I've tried the King Arthur Recipe and it is very tasty. Even though I did not grow up on this bread, I have eaten it repeatedly when I discovered it a few years into my life in the US; I even made cinnamon-swirl bread once; love that you are not afraid to proclaim your love for it and make this wonderful bread! It is light and sweet and delicious. You're right, your bread is pretty, but I've gotten to the point where I feel almost guilty when I eat white bread. Crazy! I've been craving bread so badly lately! Wow, you had me at the first picture. I can't believe you made that fine specimen of bread - it looks positively professional...and absolutely delicious. White bread is like dessert to me...it definitely has it's place and I love it! Ohhh yummy, I am such a white bread girl, for everything except toast that I need a hearty wheat bread! Cinnamon swirl bread makes a wonderful peanut butter sandwich; just ask my late cat, Henry, who loved them as much as I do. I may have to make a loaf soon! I am not a white bread hater by any means. Some bread just has to use white flour!! I would pick your bread apart and eat it piece by piece, savoring every little golden raisin... MMM! Doesnt help that I'm just finishing up breakfast...Great recipe! The cinnamon swirls look so pretty! I'm definitely trying this one day! 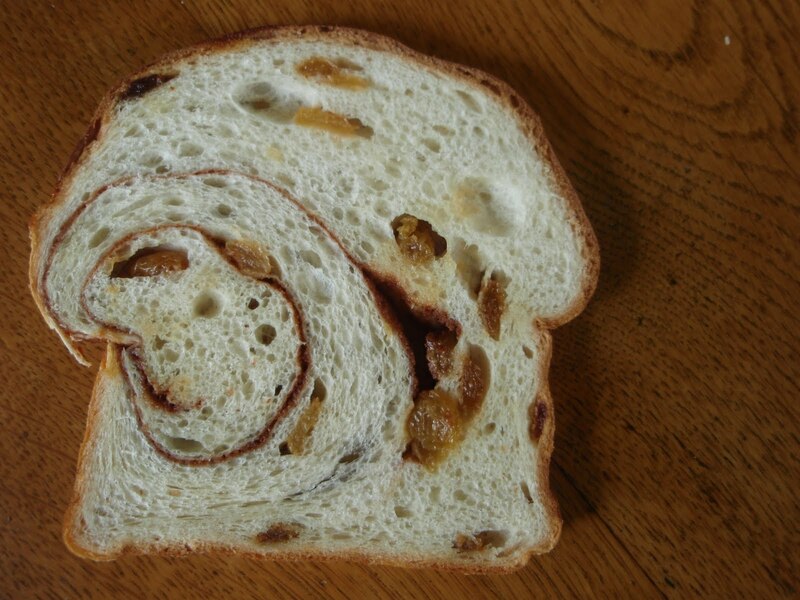 I love cinnamon and raisins- especially in bread! Bread totally intimidates me - both making it and eating it, I confess! This looks so nice and simple though. I'll have to find some french-toast-lovin' friends to make it for! IronKids bread is new to me. I've never heard of it before. Curious though. I'd LOVE to bake this bread. I'd love to bake any kind of bread actually but the thought of swirls of cinnamon calling my name makes me want to fire up the oven immediately. Of course I won't, too hot and I am so "challenged" when it comes to all things yeast. Hi Grace! It looks delicious! It's a great recipe! Thank you for sharing! I love love love cinnamon bread--the more cinnamony swirl, the better. Like a gooey cinnamon roll, but in the form of a loaf of bread. Like so much cinnamon, you have to ask "Do you want some bread with that cinnamon?" The photo with the apple jelly just made my stomach rumble! You have fantastic timing, I was thinking about cinnamon swirl bread just the other day and contemplating making some! Now I've got the perfect recipe to try. I love those swirls.....what a great reason to eat white bread! That bread is the best I've seen all week, just wish I had a slice right now! I'll have to admit that I've never made my own bread, but I love a good cinnamon swirl bread! Yours looks amazingly delicious! There is absolutely nothing better than a slice of warm homemade bread. Add cinnamon and raisins to it and you send it over the edge! That looks amazingly delicious! My favorite white bread is sourdough. But your cinnamon swirl would be my second favorite. It's PLAINLY fabulous! I love the texture...perfectly done. This would make amazing French toast. And my husband would be bouncing-off-the-walls happy if I made it for him. He'll suffer through the "healthy" bread, but he's secretly dreaming of white and fluffy. Growing up my favorite was a slice of cinnamon bread for breakfast. I could eat the whole loaf if my mom would have let me. This bread sounds delicious, and you make it sound easy to make which means I will have to give it a try. I'm a bread lover, too. The lady I sit with is 101 years old, and she loves homemade bread (reminds her of her Mother). I put a teaspoon of cinnamon in the bread dough, as well. My problem is, when I roll the bread to make the nice swirl pattern. 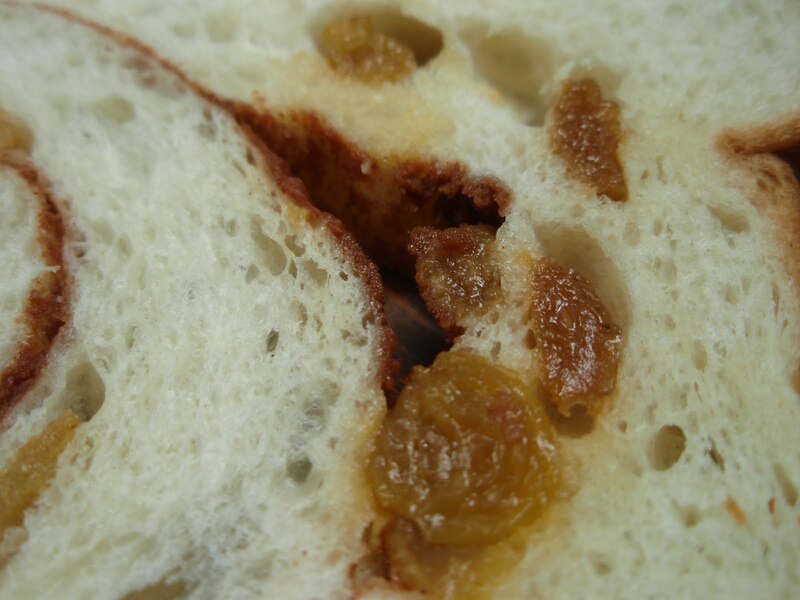 Everything looks good until we cut the bread and the bread separates and the raisins fall out. This makes a mess in the toaster, too. I've tried brushing water on the dough, milk and even an egg wash. I even tried rolling the dough tighter. So, how do you get your bread to stay together? I grew up with Wonder Bread. Toasted, spread with lots of butter and than topped with a lot more cinnamon and sugar. Yum! I love white bread especially with this cinnamon swirl toasted with butter. Believe it or not, I have been craving cinnamon swirl bread for days now. Now I REALLY want some! Gorgeous bread! It looks perfect, and that cinnamon swirl and plump raisins have me drooling!